News from LMCU: Retired? Almost there? What you need to know about Required Minimum Distributions. Or RMDs, for short. When it comes time to start withdrawing the money you've spent a lifetime accumulating in your retirement portfolio, you’ll want to make sure you’re making the right decisions. You need to know that the US government requires that you withdraw at least some of your funds annually, depending on the account type. Required minimum distributions must be taken from your non-Roth retirement accounts by April 1 each year, beginning the year after you turn age 70½. Roth IRAs are exempt. You can pick the accounts you withdraw from. If you have more than one of the same type of retirement account – such as multiple traditional IRAs -- you can either take individual RMDs from each account or aggregate your total account values and withdraw this amount from one account. As long as your total RMD value is withdrawn, you will have satisfied the IRS requirement. If you have two different types of accounts…If you own more than one type of account, such as an IRA and an employer-sponsored plan account, you'll need to calculate your RMD for both types of accounts separately and take the proper amount from each. You may be able to defer if you’re still working. 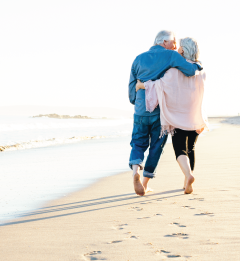 If you’re still employed at age 70½, you may be able to defer taking RMDs from your employer-sponsored plan until after you retire. You'll need to check with your employer. The penalties can be severe for failing to comply. If you fail to take your full RMD, the IRS may assess an excise tax of up to 50% on the amount you should have withdrawn and you’ll still have to take the distribution. Taxes are still due upon withdrawal. You will probably face a full or partial tax bite for your distributions, depending on whether your traditional IRA was funded with nondeductible contributions. Note: also that the amount you’re required to withdraw may bump you up into a higher tax bracket. Have questions? Contact Lake Michigan Investment Services to sort out your specific details.